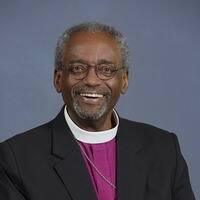 "The Episcopal Church Welcomes You," is not just a slogan, it’s who we seek to be and the witness we seek to make, following the way of Jesus. Last week I shared what I pray was a reconciling post-election message to our church, reminding us that 'we will all live together as fellow Americans, as citizens.' Today I want to remind us that during moments of transition, during moments of tension, it is important to affirm our core identity and values as followers of Jesus in the Episcopal Anglican way. Jesus once declared, in the language of the Hebrew prophets, that God's "house shall be a house of prayer for all nations" (Mk 11:17). He invited and welcomed all who would follow saying, "come to me all who are weary and are carrying heavy burdens" (Mt. 11:28). We therefore assert and we believe that "the Episcopal Church welcomes you" – all of you, not as merely a church slogan, but as a reflection of what we believe Jesus teaches us and at the core of the movement he began in the first century. The Episcopal Church welcomes all. All of us! As the Episcopal branch of the Jesus Movement today, we Episcopalians are committed, as our Prayer Book teaches to honor the covenant and promises we made in Holy Baptism: To proclaim by word and example the Good News of God in Christ; To seek and serve Christ in all persons, loving our neighbor as ourselves; to strive for justice and peace among all people, and to respect the dignity of every human being. As Christians, we believe that all humans are created in God’s image and equal before God – those who may be rejoicing as well as those who may be in sorrow. As a Church, seeking to follow the way of Jesus, who taught us, "you shall love your neighbor as yourself," (Mt. 22:39) and to "do to others as you would have them do to you" (Mt. 7:12), we maintain our longstanding commitment to support and welcome refugees and immigrants, and to stand with those who live in our midst without documentation. We reaffirm that like all people LGBT persons are entitled to full civil rights and protection under the law. We reaffirm and renew the principles of inclusion and the protection of the civil rights of all persons with disabilities. We commit to the honor and dignity of women and speak out against sexual or gender-based violence. We express solidarity with and honor the Indigenous Peoples of the world. We affirm the right to freedom of religious expression and vibrant presence of different religious communities, especially our Muslim sisters and brothers. We acknowledge our responsibility in stewardship of creation and all that God has given into our hands. We do so because God is the Creator. We are all God's children, created equally in God's image. And if we are God's children we are all brothers and sisters. Note: The Spanish version of this statement is forthcoming. We have just finishing a bruising and difficult election, one which has left many worried, fearful, and angry, and injured. I myself have never seen our country as divided and frustrated as it is at this moment. This situation calls us to be aware especially of our identity and mission as the church. By virtue of Baptism we all are ambassadors of Jesus, and our mission to serve as agents of his resurrection and reconciliation. I am convinced that we must dedicate ourselves anew to the ministry of prayer for our country and our leaders. In prayer we open ourselves to the transformative power of our Lord as we minister in our individual lives, in our churches, in our communities, and in our beloved country. I am convinced that in our discussions with others, particularly those whose views differ from our own, we should treat them according to the command of Jesus, namely, that we love each other as he has loved us. This involves respectful and patient listening as well as charitable and sensitive expression of our ideas. I am convinced that this election calls us to look deeply into ourselves and our congregations so that we become aware of the anger, self-interest, and racism that we harbor within and among ourselves. And then we can begin the difficult yet necessary spiritual discipline of rooting them out. I am convinced that that we need to lift up the virtue of the common good. Our current political process has encouraged us to make public decisions on the basis of what we individually will receive. But as Christians we know that caring about the welfare of the whole community, including refugees, is part of our vocation as Christ’s people. Justice, community, and peace flow from a commitment to the common good of all who have been created by God and for whom Christ became incarnate among us. I pray for Christ’s blessing on our country in the difficult days ahead. [ACNS] Delegations of Shia and Sunni Islam, the Roman Catholic Church and Anglican / Episcopal leaders are gathering in the Iranian capital Tehran for the fourth Christian-Muslim Summit of Religious Leaders. The interfaith dialogue brings together international leaders to reflect and share ideas around the theme of Respect for human dignity: the foundation for peace and security. “Given the rise of violence throughout the world by those who claim to be acting in the name of religion, this theme is particularly important,” a member of the Anglican delegation said. The summits began in 2007 when former Iranian President Muhammad Khatami spoke at Washington National Cathedral in the US. He called for a gathering of religious and cultural leaders from eastern and western perspectives. The first summit took place at Washington National Cathedral in 2010 and subsequent summits were held in Beirut in 2012 and in Rome in 2014. At this final summit, delegates will create a call to action around the theme of respect for human dignity and will also consider how the rich dialogue that has been the centrepiece of these summits can be continued. The Anglican / Episcopal delegation is led by the former Bishop of Washington, John Chane, who now serves as the senior advisor for interreligious dialogue for Washington National Cathedral. Other members of the delegation include the Dr Josiah Idowu-Fearon, the secretary general of the Anglican Communion; Archbishop Paul Kwong, the Primate of Hong Kong and chair of the Anglican Consultative Council; the Revd Chloe Breyer, executive director of the Interfaith Centre of New York; and Ms Ruth Frey, the senior program officer for Justice and Reconciliation at Trinity Church Wall Street in New York. The Revd Canon John Peterson, director of the Centre for Global Justice and Reconciliation at Washington National Cathedral, serves as co-coordinator for the Christian-Muslim Summits. This week’s summit, which began yesterday (Sunday) will conclude on Wednesday (9 November). Afterwards, delegates will visit the pilgrimage cities of Qom and Isfahan. At the conclusion of a contentious election process, we are left with a country that is more divided than ever before. As we look at the challenges facing us as a nation, the deep divisions that are fracturing us, I call on the clergy and laity of the Mountain Sky Area to be in prayer together, as we seek the healing of our nation. We who follow Jesus are called to offer our neighbors the love of God in all we do. In our words and actions, we need to offer hope to those who feel despair and healing for those who feel broken. Yet, Jesus calls us to do much more. The love we are to share as disciples of Christ is transformative, changing individuals, families, communities, and yes, even the entire world. I believe in the power of love. And whether today we are lamenting or celebrating the election, here is what I know to be true: the love we as Christians are called to live out cannot be legislated. It is not controlled by politics. It is to be lived out, not talked about or debated. This love is realized when we stand with the poor and marginalized. It is embodied when we seek justice for the oppressed. This love is the heartbeat of humanity that cannot be stopped by hatred or fear. It is the recognition of our brother and sister in those whose names we don’t know, whose dignity we will honor and respect. This is the love God calls us to, which always and forever moves us all towards Beloved Community. So, today and in the days to come, may we get on our knees to pray for our nation and the world’s peoples. And then, let us rise from our knees to love our brothers and sisters, the leaders of the world, including President-elect Donald Trump, the earth, and all living beings. As followers of Jesus, we can do no other. The media loves conflict and the religious right has faithfully delivered it to them for many years. As we rapidly approach election day, the question of which religious right figures will stick with Donald Trump or reluctantly disavow him consumes whatever media attention is focused on the faith community. For decades, some prominent religious right figures have been waging a "culture war" in our nation and have named it as such. They lament the demise of a Protestant white, male-dominated culture in which people of color, sexual minorities, and women were silenced and oppressed. Donald Trump is, for now, their standard bearer. Racism, misogyny, and hatred of immigrants and Muslims mark his campaign. Many of the Christians who are part of the denominational traditions represented in the National Council of Churches, by contrast, are engaged in a biblically-based countercultural ministry. We are feeding the hungry, caring for the sick, visiting those who are in prison, and freeing the oppressed. We seek a society that welcomes the stranger, assists those in need, cares for the earth, and re-orients national priorities away from war, violence, and racism. It is not particularly unusual for social concerns to be addressed in congregations associated with the NCC whether from the pulpit or in Sunday School or other forums. The political and theological views of our church members, while labeled by some as liberal, are actually very diverse, and that diversity is deeply valued. Few, if any, NCC denominational leaders or clergy have publicly endorsed one of the presidential candidates. In fact, quite often clergy and laity are under the mistaken impression that it is illegal to invite candidates to speak in local churches. A large number of congregations avoid any talk of political matters. After all, there is usually plenty of politicking already taking place over matters such as the color of the new carpet in the sanctuary. This presidential election season, the wildest in recent times, requires careful study. Rather than tell our members how to vote, the NCC and some of its member communions provide voting principles, and study guides to help them make informed decisions. As a Christian, I want to believe the direction of our nation, with fits and starts, is toward one of more inclusiveness, acceptance, and justice. But what if I'm wrong? When the dominant culture or race becomes fearful, as is the case at this time, problems result. Perhaps we will choose a more negative direction. Britain has exited the European Union, Colombia has voted to reject a peace agreement, Israel has constructed a wall to keep out Palestinians, Hungary has built a fence to keep out immigrants. There's no certainty love, grace, and mercy will triumph. I hope I'm mistaken in my hunch that most our congregations are avoiding discussion of the choice ahead of us next month in order to avoid conflict. I pray our clergy and laity are praying and calmly analyzing the issues and the candidates and preparing to vote so that they can answer this question: "What does the Lord require of you but to do justice, and to love kindness, and to walk humbly with God? (Micah 6:8, NRSV)"
October 4, as a Season of Creation." and http://seasonofcreation.org and share as you think appropriate. Words From the Bishop - Good is stronger than Evil, Love is Stronger than Hate. "A voice is heard in Ramah, weeping and great mourning, Rachel weeping for her children and refusing to be comforted, because they are no more." church, we are called to reduce violence and should, in most cases, restrain ourselves from using violence. Whether or not statistics show that overall violence has declined in recent years, every person wounded or killed is a precious child of God. As bishops of the Evangelical Lutheran Church in America, we lament the tragedy of gun violence in our country. We are grieved by the way violence threatens and destroys life. We affirm the current soul searching and shared striving to find a way to a better future. While the church grapples with this call to reduce violence and make our communities safer, we recognize that before God we are neither more righteous because we have guns nor are we more righteous when we favor significant restrictions. Brokenness and sin are not somehow outside of us. Even the best of us are capable of great evil. As people of God we begin by confessing our own brokenness - revealed in both our actions and our failure to act. We trust that God will set us free and renew us in our life's work to love our neighbors. In this time of public attention to gun violence, local communities of faith have a unique opportunity to engage this work. As bishops, we were thankful to recognize the many resources our church has already developed (see below). We begin by listening: listening to God, to Scripture, and to each other. Providing a safe place for people to share their own stories, together we discern courses of action. Together we act. And together we return to listening - to assess the effectiveness of our efforts to reduce violence.